Are you always fumbling for your passport or hotel room key, getting lost in airports, or struggling with the local language? The travel industry has always been quick to embrace new technology – think boarding passes on phones and ePassports – and it shows no sign of slowing down, as these upcoming innovations prove. Airports have long been early adopters of new technology to make travel hassle-free. After all, it's been possible to choose a seat and get a boarding pass via an app for years, but now comes the next step; using your face to check in, at bag drop, and even as your passport and boarding pass. Already this year, Changi Airport in Singapore and Los Angeles International Airport have trialled biometric facial recognition, where photos taken of passengers are compared to their own ePassport photo. It takes between three and five seconds. The same tech installed into cameras around the airport could also be used to locate and identify passengers who are late for their flights. Robots are better than people; they do one thing, and they do it well. For free. That's the theory behind the idea to use robots extensively in airports and hotels. 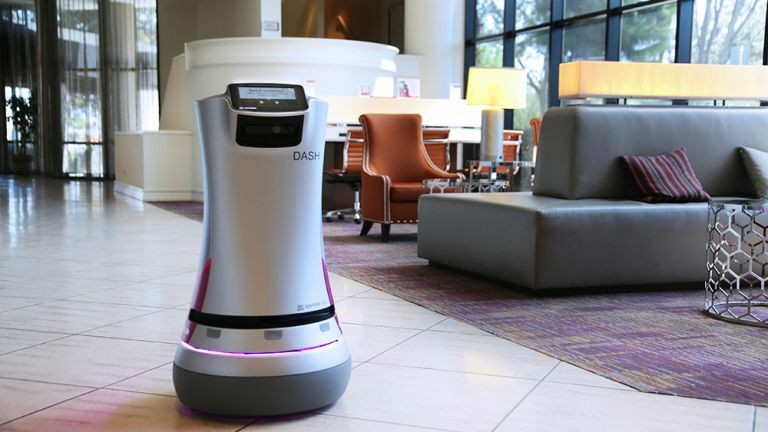 The Savioke Relay room service robot learns the map of a hotel's rooms and elevators, and navigates them seamlessly. What’s more, it can carry food, drinks, towels and toiletries in its head. Meanwhile, LG's CLOi robots for the hospitality industry deliver food and drinks to travellers in hotels and airport lounges. Its Serving Robot has a built-in sliding tray, Porter Robot carries luggage to you, and Shopping Cart Robot scans barcodes on items you buy from hotel stores and kiosks. LG also has an Airport Robot that can deal with passengers' questions about flights and gate information in Chinese, Korean, Japanese and English. Are you nervous about getting lost on your travels and not being able to speak the lingo? One of the biggest sources of stress when travelling is the language barrier, which can make simple transactions difficult. Cue new handheld devices that allow instant translation between two people having a conversation. Looking something like a Nintendo Wii nunchuk and working completely offline, Ili translates your words instantly. It specialises in asking for directions, ordering food in restaurants, and shopping, and as yet only deals in translating English to Spanish, Mandarin and Japanese. Have you ever used your smartphone to open your hotel room? Keyless hotel room entry is catching on among luxury hotel chains, with W Hotels, Westin, iClub and Hilton already allowing guests in some of their properties to open their rooms with a swipe of their phone. The doors themselves use RFID electronic locks, but the plan is a bit bigger than merely allowing tech-savvy guests to geek out as they check in. This is about making the whole process as smooth as possible; you book your hotel, arrive at the hotel, and get into your room without ever having to wait in line or speak to anyone. However, in practice it's not quite as sleek as it seems, since you still have to download and log in to an app before trying your door. Passports are a pain to travel with – not least because they can get lost so easily. If there are expensive visas inside, it can make replacing your passport a nightmare. So why not store everything electronically in the cloud? The next generation ePassport will store visas and entry/exit stamps, as well as the owner's identity and biometric data, on secure cloud servers that can be accessed by immigration staff in every airport. It’s likely to include blockchain, the technology behind Bitcoin and other digital currencies. Blockchain is a high-integrity database whose contents cannot be tampered with – so it can be trusted by all who share it and can even be used to create proven digital identities. Travel is all about finding yourself. And, thanks to Google Maps, that old cliché generally still holds true. Except when you're indoors. Looking to change that is the concept of installing small, low-power Bluetooth beacons in airports, hotels, museums and shopping malls that enable people to navigate inside as they already do outside. Gatwick Airport is the first airport in the world to have a fully functioning indoor navigation system, with 2,000 battery-powered beacons able to guide passengers to check-in desks and boarding gates using arrows on an augmented reality app. Also expect push notifications that warn you if you’re running late. Such beacons also enable apps to open at the correct geographical place; as you approach the check-in desk at a hotel, or the airport gate for boarding, your reservation slip or boarding pass will appear on your phone. The main reason that travel is stressful is the huge expense, but you’ll soon be able to fly between Europe and North America for less. Although there are now several services that can fly the 17 hours between London and Perth, Doha and Auckland, and Los Angeles and Singapore, such ultra-long haul flights can only be done on big aircraft such as the Airbus A380 and the Boeing 787-9 Dreamliner. That's means high prices. The real revolution will be when single-aisle aircraft can fly across the Atlantic – and those days are now not far away. In March 2018, Airbus' new A321LR NEO jetliner conducted a record-breaking flight from Mahé in the Seychelles to Toulouse, France, covering a total distance of 4,750 nautical miles in 11 hours. That's the longest range of any single-aisle jetliner. The A321LR NEO can carry 240 passengers, while Boeing's upcoming 737 MAX 10 will have a range of 3,300 nautical miles. This could all help kick off a price war among transatlantic airlines.